Keeping up the impressive performance in 2018, the Influential Software team continued to service a wide range of UK businesses this quarter. 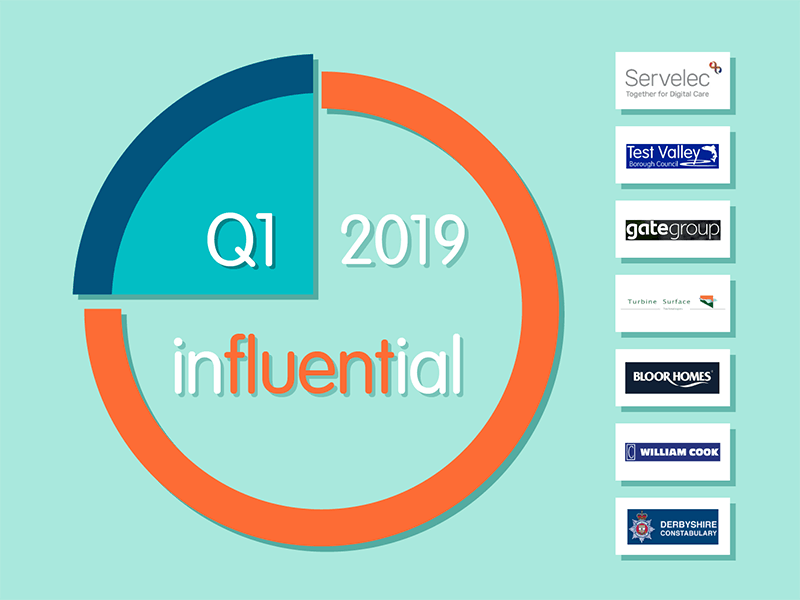 Our new clients in Q1, 2019 included construction, local government, digital services, manufacturing, and a major police force. We’ve also worked to diversify and expand our services, staying at the cutting edge of digital solutions from business intelligence to software development, integration to training, and recruitment to website development. So without further ado, let’s look at Influential Software’s highlights from Q1, 2019. Bloor Homes is one of the UK’s largest family-run housebuilders, with a history of 50 years. From construction to architecture, craftsmanship to design, Bloor Homes provides high-quality new builds with all details in place. The client benefitted from Influential Software’s document management expertise, which enabled the company to accelerate business processes and satisfy customers better than ever before. After partnering with us in Q3 2018, HULFT announced plans to expand in Europe. With our integration expertise and HULFT’s data logistics platform, this plan is on track to succeed. Gate Group is a global leader in airline catering, retail, equipment, and hospitality. The group serves 700 million passengers annually across 60 countries. The client sought out Influential Software for skilled staff to support the group’s technical operations. Our recruitment team at Influential People and 365 Recruitment supplied the specialist talent they required. Derbyshire Constabulary is the territorial police force for around 1 million people. The force covers an area in the East Midlands of over 1,000 square miles. The client drew on Influential Software’s decades of business intelligence experience, ensuring the force operates at maximum efficiency to better serve residents in Derbyshire. Servelec is a technology company active in the healthcare, social care, and education sectors. The company offers an integrated digital approach to these sectors with the aim of improving access to information and boosting efficiency. Servelec engaged Influential Software based on our reputation for high-quality, results-oriented BI training. With those digital skills, the Servelec team has gained a more competitive edge among its public sector clients. Test Valley Borough Council is responsible for the Test Valley area of Hampshire. The borough has been ranked as one of the best rural areas to live in the UK, based on overall standard of living. The client turned to Influential Software for help optimising its BI systems and upskilling council staff. This is part of the council’s ongoing effort to streamline processes and allocate resources to maximum effect. Following on from successful Azure projects, Influential Software decided to advertise these services through a dedicated Azure website. Potential clients can now find a comprehensive partner for Azure development, deployment, migration, integration, hosting, security, and support. Turbine Surface Technologies, a joint venture between Rolls-Royce and Chromalloy, is a manufacturing company that provides specialist coating solutions for turbine components. The client contacted Influential Software on the basis of our document management expertise. With the right solution in place, the client gained a more collaborative and efficient IT system. Our team joined the integration elite at the London leg of Dell Boomi’s 2019 World Tour. As always, we picked up the latest iPaaS innovations to pass on value to our UK customers. William Cook is the UK’s largest manufacturer of steel casings. Based in Sheffield since 1883, the company specialises in supplying the defence, rail, and industrial sectors. The client was attracted to Influential Software’ strong record with the manufacturing sector. Having supported UK business for 25 years, our team is familiar with both cutting edge systems and the legacy systems that many established companies still use. It’s clear from these stories that Influential Software has enabled transformative change across business sizes and sectors this quarter. And whatever next, we know there are many influential clients to come. But for now, here’s the good news: unlocking your digital potential is simple. It all starts with a message to one of our experts.